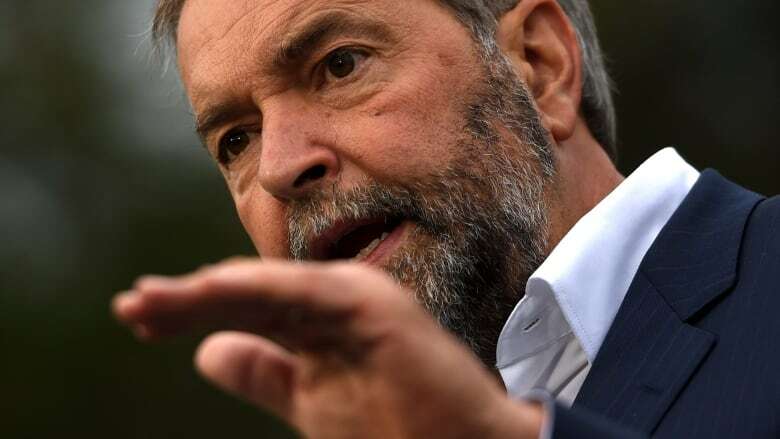 A New Democratic government would use the purchasing power of the federal government to negotiate lower prices for prescription drugs and pass those savings on to the provinces and territories, NDP Leader Tom Mulcair says. The NDP plans to spend $2.6 billion over the next four years to "work towards a plan to support universal comprehensive public drug coverage for all Canadians," if it takes the Oct. 19 vote. The party is not committing to implement full coverage by the end of its first mandate, but Mulcair said he hopes to achieve average savings of 30 per cent in prescription drug costs through bulk buying. Once in place, the plan would save the provinces and territories up to $3 billion annually. Health care is a provincial and territorial responsibility, so an NDP government would have to negotiate precise arrangements with the other various governments. It would not have the power to impose a free coverage scheme. Some provinces, however, have been pushing for such a scheme for some time. The announcement follows a series of health-care commitments made by the NDP earlier this week, amounting to nearly $5 billion in campaign promises. Mulcair made today's pledge at a seniors' facility in the riding of Regina-Wascana in Regina, which has been held by high-profile Liberal candidate Ralph Goodale since 1993. It is one of only two federal Liberal seats in the Prairies. The New Democrats have suggested they believe Goodale's seat is fairly secure, but have hopes for the other two ridings in the city: Regina-Qu'Appelle, held by Conservative candidate and House Speaker Andrew Scheer; and Regina-Lewvan, a new riding formed when boundaries were redrawn after the 2011 election, with no incumbent. But a survey of the breakdown of votes within the boundaries of Regina-Lewvan suggests that, had the riding existed during the 2011 election, the NDP would have taken it by 500 votes over the Tories.